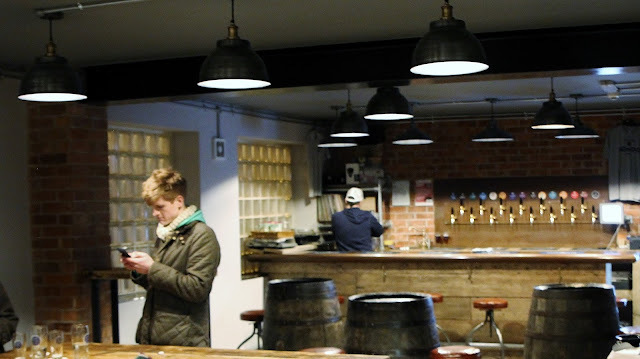 There really are only a handful of great brewery taprooms in London. Mondo Brewing Company has one of them. Ever since The Kernel popularised the concept of 'drinking at the brewery', many other London breweries have emulated the setup. * It is a great concept: it allows the consumer to drink the beer as fresh as possible, and to connect with the brewery on a more personal level. Saturdays at The Kernel quickly turned into Saturdays at [insert Bermondsey brewery], and many other breweries around the capital have followed along in due course. "There is something to be said for a brewery that creates a space to serve customers in a more permanent, comfortable setting." But few breweries have expanded beyond the Saturday-only or weekend-only model, or put in much effort to actually foster a truly nice drinking experience. To be sure, I do enjoy drinking at the makeshift brewery bars that have sprung up in railway arches and industrial parks. Yes, there is a certain romance to drinking beside a brew kit; however, there is also something to be said for a brewery that creates a space to serve customers in a more permanent, comfortable setting. The Mondo Brewing Company Tap House is just such a place. During a visit to the taproom at the end of November, I walked into a neatly laid out bar area, with seating for perhaps 25 people or so. The music was reggae on vinyl, the scratchy warmth of the record hammering home that this is a cosy taproom, not an airy production facility. (While the brewing area is completely separate from the taproom, you can still view it in all its stainless glory.) On the far wall of the taproom, 14 different taplines of Mondo beers stood at the ready - in addition to one guest beer, which at the time was Brooklyn Brewery Defender (the 2015 iteration). I also noticed a small selection of bar snacks; however, on this visit I did not eat. As I worked my way through a selection of the beers, I chatted to the barman, Tom Palmer, who is one of the co-founders and brewers at Mondo. Palmer, who hails from the US, told me they were trying to create an 'American style' taproom where the primary aim would be to showcase a broad range of beers. The team at Mondo has certainly hit that target. With few - if any - exceptions, there is no other brewery taproom in London with such a comprehensive range. Fourpure and Beavertown come close, but they cannot match the ambiance that Mondo confers on its patrons. "The beers covered an impressive amount of terrain, stylistically speaking, signalling inspiration from Germany, Belgium and the US." While selection and ambiance and snacks are certainly important, I visit taprooms for the beer, first and foremost, and the drinking experience is usually better when the beers are good. In this regard, too, Mondo delivers. The beers I drank covered an impressive amount of terrain, stylistically speaking, signalling inspiration from Germany, Belgium and the US. My favourite beer of the day was All Caps, a 4.9% American pilsner defined by crisp biscuits, light bitter hay and grain husk. Also impressive were Berry White (a blackberry Berliner weisse), Coco Loco (a smoked coconut porter), Watch Maibock (a German maibock), Mundo Diablo (a hoppy American brown ale), and Up in Smoke (a fairly classic German rauchbier). That is an impressive amount of variety, and it covers less than half of the Mondo beers that were available on tap or in bottle. Having named the Mondo Tap House as the Best New Pub/Bar Opening of 2015 in my Golden Pints (and Mondo Brewing Company as runner-up for Best New Brewery Opening of 2015), it is obviously no secret that I am a fan of the work that they are doing. As we begin the new year, I hope more of you become aware of this great work, and perhaps even venture down to Battersea to try the beers from the source. *We could squabble over other breweries that might have had a 'drinking at the brewery' angle before The Kernel in 2010, such as perhaps Meantime or Fuller's, but when tracking the breweries most relevant to the more modern beer movement ('craft', if you will), I choose The Kernel as the forerunner. **Regardless of what you think - or thought - about London Fields and its ownership, the brewing team there did put out some very good beers. Interesting that they're ex-London Fields - the taproom there, pre all the upsets, was almost exactly the kind of permanent, comfy drinking space you described, with a fairly broad range of beers that included guests. I've not been back recently so I don't know how it is now. Indeed. The taproom now is an improvement, I would say. A lot more focused, with only kegs and bottles, with a more inviting atmosphere. Must admit I really liked that LFB also had cask beers on, and sometimes even had the same beer available on both keg and handpump, which could make for interesting comparisons. Thanks for making me jealous and homesick, you c*nt. Good read though, I enjoy keeping up through your writing. Take care buddy. That's high praise. Thank you.